Show a hint that cookies are used on your website. Hint can be closed or permanently hidden. 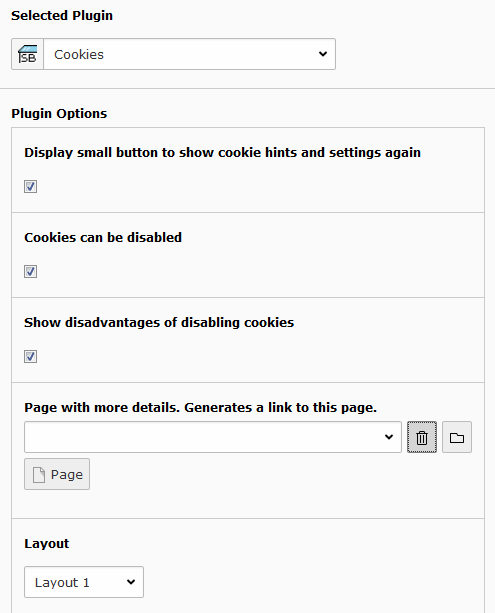 User has the possibility to disable cookies (optional, if enabled by TYPO3 integrator). 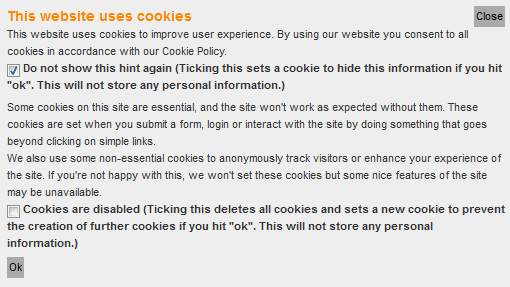 Then, all cookies are deleted and a small button is displayed for enabling cookies again. Widget can be added as plugin in one page or with TypoScript on every page. Fluid template. You can modify anything! Widget on top of the page, simple. Widget on top of the page, with possibility to disable cookies. Widget on top of the page, alternative layout, with possibility to disable cookies. If you have a login on your page, the login is possible because this extension does not prevent the creation of new cookies. In this case, you should write a hint that a cookie is created when logging in. If you use analytic tools or other extensions, which create cookies, these cookies are still created if you do not prevent his. See chapter "TypoScript condition" for details how you can prevent this. If you provide the possibility to disable cookies, you also have to include the following TypoScript setup on the process page (plugin.tx_cookies.pidProcess). Otherwise the cookies will not be disabled. You have ideas? Contact me! See file ChangeLog in the extension directory.